Michael Crichton's novel opens on the threshold of the twenty-first century. It is a world of exploding advances on the frontiers of technology. Information moves instantly between two points, without wires or networks. Computers are built from single molecules. Any moment of the past can be actualized - and a group of historians can enter, literally, life in fourteenth-century feudal France. Imagine the risks of such a journey. Not since Jurassic Park has Michael Crichton given you such a magnificent adventure. Here, he combines a science of the future - the emerging field of quantum technology - with the complex realities of the medieval past. In a heart-stopping narrative, Timeline carries you into a realm of unexpected suspense and danger, overturning your most basic ideas of what is possible. ©1999 by Michael Crichton (P)1999 Random House, Inc. Random House Audio Publishing, A Division of Random House Inc. I enjoyed this book more than most, and am now 1/3 of the way through my second listining. I almost didn't start it the second time because of the narrator. Most of his vocal charactarizations were at least OK, even his Arnold imitation of the Merrik character got the point across that he wasen't an American. To show that he was Dutch, and use Goldmember's accent (Bring out Austin Power's Faaasha!) would have been too much. I can live with this one. The use of a whispering voice for the Gordon character, who was key for many important science-type explainations, was the most annoying. I listen to AudioBooks while driving, and had to back up and shove my ear plug right up against my eardrum to hear what the character was trying to say. Also, whenever two of the other characters were involved in an 'aside' between themselves (like saying something they didn't want the others to hear), the narrator would actually either whisper, or lower his voice so much that I couldn't hear what was going on. I gave the book a '4' for content and general listenability. I had to average in the '1' I gave for narration. The narrator should be required to listen to his own performance before being allowed to release this edition to the public. Otherwise, I found the Quantum theory explainations to be facinating. "If you can explain Quantum Physics, you don't understand it yourself." Its so counter-intuitive, and trashes most or all 'Natural Laws', that explaining it at all was quite a streach. Good job here. This book is a Cliff-Hanger, Sci-Fi, psudo-historical genre. If you don't like this type of fiction, don't buy it. Of course its going to be somewhat predictable. Naturally its going to be a 'damsel in distress' old movie seriel type of book. Expect it! I liked especially the descriptions of Medevil France. I've read alot of histories, but none brought across the absolute brutality of this world as well as this author. Life back then was Short & Violent. 63 sur 65 personne(s) ont trouvé cet avis utile. I didn't know what to expect when I downloaded this book as I had never previously read anything by Crichton. I was pleasantly surprised. The first part of the book combines real history with (mostly) real science and then, almost seamlessly flows into the fantasy/sci-fi story-line. Crichton slowly introduces his main characters, and he develops them into believable persons about whom we start to form our own opinions. However, it's when the setting jumps from the present back into the 14th Century that Crichton expands our knowledge-base, and the story really starts to unfold. Using well-researched history - social, cultural and economic - Crichton tells a story of another era when life was hard, and often little-valued. Our protagonists race against time to uncover a secret, a secret which might enable them to fulfill their mission and possibly enable them to return safely to the present time. A thriller, which is also educational - very satisfying. Slow To Start, But Worth The Wait!! Even as a Mathematician, I found the book a bit slow to start, but WELL worth the wait. This book is absolutely gripping; you are sure to find yourself unable to turn it off!! The ending is absolutely perfect! After purchasing this book, i've since passed it on to anyone I know that enjoys history, time travel, adventure and descriptive fiction that never ceases to pull you in! This is an absolute must buy!!! If you have seen the movie that attempts to touch on the highlights of this wonderful book, please GET ALL THOUGHTS OF IT OUT OF YOUR MEMORY NOW and order the unabridged audio-- it is NOTHING that even remotely resembles the book. I just can't say enough great things about this book, it is a tie with The Da Vinci Code as one of my top picks. If you get a couple hours into the audio and find yourself a bit bored and wanting a stronger plotline and more character development-- hang on! You're almost there, it kicks in explosively and takes you on and incredible ride! Don't skip this book because you didn't like the movie. The book has a good story line and good character development. Enough detail so that you understand the plot (the movie was terrible in this regard). The book moved along at a good pace. It did get bogged down once or twice but not enough to distract from the story. Its not a masterpiece and won't become a classic but it is a good and entertaining book. I would recommend. By the way, the reader was excellent which adds to the enjoyment of the book. Only get this recording if you find an unwavering backdrop of "tv static" and chatting technicians to be in anyway desirable. Not only is the recording "fuzzy," you can literally hear people (possibly audio director and sound technicians) talking in the background. Their voices are quieter than a whisper, but are nonetheless distinct and are, in effect, seriously creepy. Like many of you, I have vision problems so I have to listen to my books, but other companies (ex. Audiobook Store) have a remastered version of this *exact same recording* that is as crisp and clear as a nicely chilled glass of Riesling. This version is...the audio equivalent of mud slopped into a tin can. b) Most importantly *to let audible know that this recording has been improved by companies with many less resources. I suspect that you, the company, did not know exactly how bad it is. Please inform me if the recording is replaced with a higher quality version (to reps, there is a version of the exact same reading by the same narrator--someone just cleaned up the audio quality) and I will change my review immediately. Timeline is a fast-paced science fiction novel which incorporates time travel, historical conflicts during the dark ages (France, 1357) and a group of current day historians and students who are caught dangerously in the middle. Although slightly “cinematic”, Crichton provides just enough character development, time travel technology and historical reference to keep this book “lightweight” and enjoyable throughout. I especially enjoyed the portrayal of Europe in the 1300s as compared (or actually contrasted) to our current lifestyles. Political affairs, personal interests and greed seem familiar but everyday survival and personal success take on an entirely different meaning. I found it hard to put down towards the finish. The narration and sound quality were good. Loved this book. Crichton does such a great job at explaining quantum theory. I was on the internet for hours trying to find out if he was really telling the truth. What an idea! I listen to Audible while sewing and I HATE to sew. Let me tell you, the time flew by spending it in 14th century France and I got a LOT of sewing done. Okay, so Michael is no Charles Dickens, but he is damn entertaining. If you want escape, he's the guy for you. I saw the movie the day it was released. It was a fast track of the book, following it more or less loosely. But it was just as enjoyable; maybe a little more so, because I knew something of the characters' backgrounds. Now when I listen to the book again, I can put faces and places in my mind's eye and have a great time all over again. Good story, switching between the present and the past. I enjoyed the peek into the way we lived 700 years ago, and the details of the time. Time travel would really be marvelous, and the author does an excellent job of describing this concept. This was my first Michael Crichton book and I loved the book. It was a blend of a Midevil and futuristic world. Never ending suspense! This book is quite entertaining if you don't mind some bloody beheading and other violent acts going on. Very detailed and gripping descriptions of medieval time and exciting action (sometimes almost a little too much - I think I would have enjoyed a little less pressure in order to enjoy the detailed description of the medieval setting more). I found the beginning a little though-going. Ridiculously simplified explanations of complex physical phenomena (and their implications) were mixed with detailed (and rather boring) description of practices in historical research. But once the actual time-traveling comes into play, the novel becomes entertaining. top time travel fiction wie sie nur von michael chrichton geschrieben wird. Entführt den Hörer an Originalschauplätze sowohl in der Gegenwart als auch der Vergangenheit so glaubwürdig, das man meint,die tagesnachrichten zu hören.Für Liebhaber von Science fiction oder Abenteuer gleichermassen wertvoll.John Bedford Loyd als Leser,the man for the job. Timeline ist typisch für Michel Crichton. Wissenschaftlicher als die meisten Sci-Fi Bücher, wie fast alle seine Bücher. Mit dem Thema Zeitreisen und dem Spätmittelalter, wer also beide Themen mag sollte eventuell mal in dieses Buch reinhören. This Book is as unique as only Michael Crichton could have written. Hard Science and imaginative speculations braided together with likable characters and a story that won't let you go until you finished it. With some small twists and a fitting ending, it is a very good story, even overlooking a small logical error by the author. The narator is fitting for the setting, and makes the characters easily distinctable by voice. The only problem I have is with the recording itself: Sometimes between Chapters, there are silent pauses up to 30 seconds, in which you will wonder if your phone has crashed or if your headphones died. If you have a historical interest and like Technothriller, this book is for you. 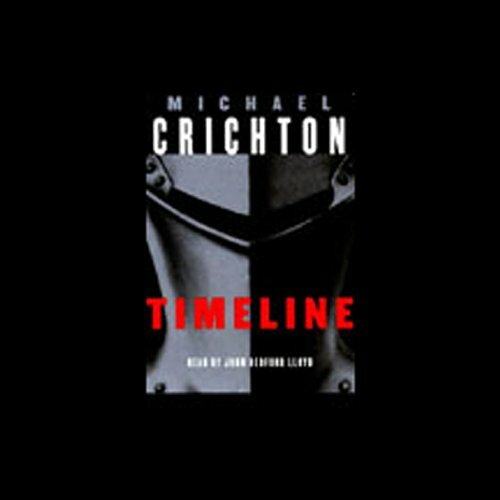 Timeline is another exciting book by Michael Crichton. The start of the story is very fast, then it has a lack of suspense, but just very briefly. The story develops very good and it's so thrilling after a while, that you just can't put it down. 6 sur 18 personne(s) ont trouvé cet avis utile.